A new “great force of nature” is so rapidly and profoundly transforming our planet that many scientists now believe that Earth has entered a new chapter in its history. That force of nature is us, and that new chapter is called the Anthropocene epoch. In reshaping Earth to sustain our societies, we humans have altered Earth’s climate, polluted her atmosphere, oceans, freshwater, and soils, driven thousands of species extinct, and spread weeds, pests, and diseases around the world. Even as human populations continue to grow and develop, more than three quarters of Earth’s land is already covered by farms, pastures, cities and other human infrastructure, or fragmented into smaller parcels in the lands in between. While most humans are living longer, healthier lives and eating higher on the food chain, the rest of life on Earth is being pushed into the margins. More than 90% of Earth’s mammal biomass is now composed of humans, livestock, and pets. Should plastic pollution continue at current rates, there will be more plastic than fish in the sea by 2050. It is not hard to see why so many consider the Anthropocene to be an unmitigated disaster. Can human societies change these trends and bend Earth’s trajectory towards a better future? Will the Anthropocene become a story of awakening and redemption, or a story of senseless destruction? At this point in Earth history, the Anthropocene is still young and the jury is still out. But even at this early stage, there are already many diverging narratives explaining the emergence of the ‘age of humans’. Some see the start of the Anthropocene as a clean break from an earlier time when human societies lived within the limits of a ‘natural’ Earth system – a time when natural environments shaped human history, and never the other way around. Others, including the stratigraphers of the Anthropocene Working Group, recognize the continuous nature of anthropogenic environmental change and its deep roots in prehistory, yet still choose to focus on defining a discrete time boundary for the Anthropocene in the middle of the 20th century. Others look deeper still, observing significant human transformations of Earth’s biosphere, atmosphere, and climate starting in prehistory as the result of megafauna extinctions, deforestation and land clearing using fire, the tillage and irrigation of agricultural soils, the domestication and transport of species around the world, and other increasingly globalized social-ecological transformations that continue to shape our planet at increasing scales into the present day. Outside the sciences, arguments rage over the meanings and societal implications of a new age of humans. The politics of inequality, environmental ethics, and the challenges of responsible action under conditions of potentially catastrophic global change have all been connected with the proposal to recognize the Anthropocene. Is naming an age of Earth history after ourselves anything more than the ultimate act of hubris by a species that is rapidly driving Earth to ruin? Will recognizing a time in which the natural world is reshaped by humans cause people to give up on efforts to conserve nature? Who is causing the Anthropocene? Is global environmental change – and global climate change in particular – the product of ‘human activity’ in general, or the result of a capitalist conspiracy among rich elites and the producers of fossil fuels? Indeed, billions of Earth’s poorest use hardly any fossil fuels at all – and yet will suffer the most from their planetary consequences. It is not hard to understand why the Anthropocene has emerged as a flashpoint of discussions about nature of humanity, the role of humans in nature, and even what it means to be human. One thing is sure. At this time in which we change the world as we know it, we must also change the way we know the world. The Anthropocene calls on us to think bigger than our individual lives, to imagine the operations of an entire planet and its changes over timescales longer than human societies, from start to finish. The Anthropocene tells us that, together, humans are a force of nature. On the road ahead, better and worse anthropocenes exist. The story of the Anthropocene has only just begun. There is still time to shape a future in which both humans and non-human nature thrive together for millennia. There is still a chance for each of us to write a better future into the permanent rock records of Earth history. Featured image credit: lego doll the per amphitheatre by eak_kkk. Public domain via Pixabay. Erle C. Ellis is Professor of Geography and Environmental Systems at the University of Maryland, Baltimore County (UMBC). His research investigates the ecology of human landscapes at local to global scales towards informing sustainable stewardship of the biosphere in the Anthropocene. 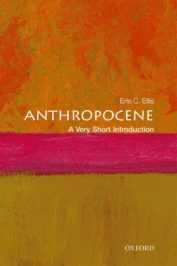 He is the author of Anthropocene: A Very Short Introduction.